Bright red lips. Shaved heads with a bit of a fuzz instead. Dresses that appear to be her boyfriend’s suit jackets sewn up. Large chunky footwear that must have been lent by the boyfriend. Yeah, this look is stirring something in us and we can tell that Jonny Johansson was imagining the “walk of shame’ moment of the day after a night of a little too much tipsy fun. 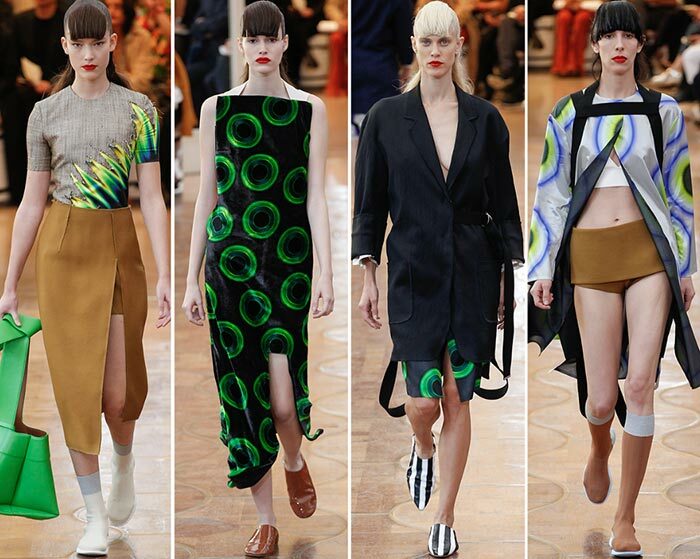 Other than that, it was all about the music really, that theme playing it up nicely throughout the presentation of the Acne Studios spring/summer 2016 collection on the Paris Fashion Week runway stage. There are embroidered Plexiglas and chrome guitars on the boxy suit jackets we see, while we notice velvet dresses and loose satin coats. There was color in the show, that is for sure, without going way overboard. We see everything from green shades to red, black looks and white ones. We see high slits and open midriffs, lots of legs and soundwave zigzags. Glossy leather? Check. Pretty snakeskin? Check. Compact disk resembling circles? Check! Add a jagged fringe and some satin and you are good to go! Tall bangs starting from high back on the crown mark the hair that has been created for this occasion. Stripes, checks and overall little to no heels mark the whole footwear trend thing happening, while extremely tiny skirts do peek through to make us wonder or not there was a shortage in fabric to come up with the right styles. And if that whole rock star thing holds no appeal, why not turn the sunglasses into guitar figures as well? After all, it does seem to be the biggest thing alongside the jukebox disks. 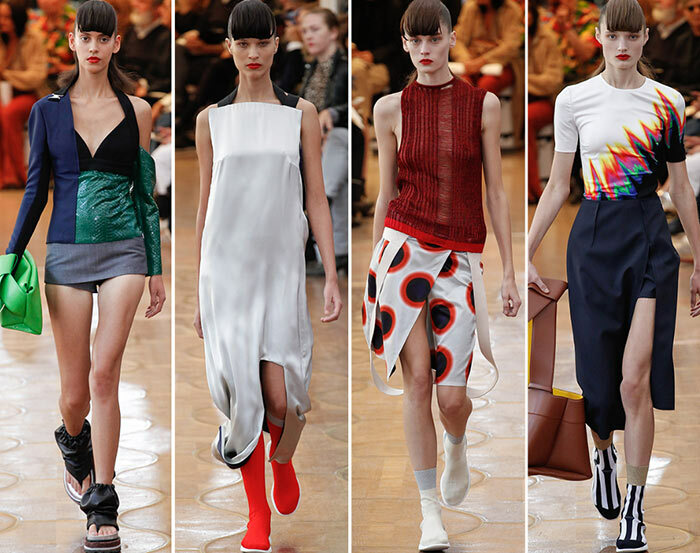 Trends we see happening in the Acne Studios spring 2016 fashion line are the slits up the center in skirts that fall to the knees, skirts marked with the disc-like prints. Alongside the slits we see plunging necklines, micro shorts and micro skirts, comfortable footwear and slouchy dresses alongside the whole transparent or translucent effect happening. We hate the open toe flip flop booties but we love the more fitted checked or striped and even simply white shoes which might not give height but they do not make your legs look extra bloated either. Plus, who does not love sock boots? It is the loveliest designs in cooler weather footwear out there. 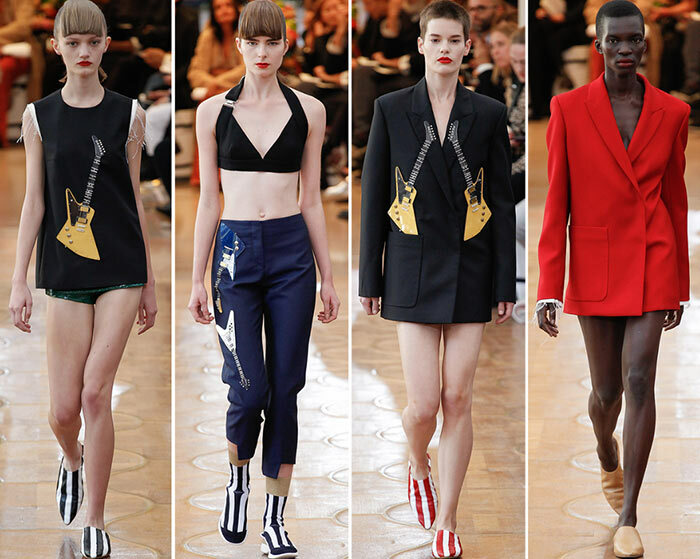 The whole gender specific clothing thing also went out the roof with the Acne Studios spring 2016 lne-up as the Paris Fashion Week decided to embrace the new norm of raising a new person with a choice to lean either one way or another. According to most, it has been a great improvement for the Acne brand this year against the whole felt thing happening in the past. Even so, we await next year’s surprises and prefer for Jonny Johansson to always have a theme to stick to. It really helps liven things up greatly! While Acne Studios may not be the best brand on the market, it has been coming to with leaps and strides of late, for which we have to applaud.